Last week someone asked me about the ministry I am involved in, meaning the non profit that I run. I spent the next few minutes telling her everything that I do, trying to make it sound as interesting and full as possible. I found myself getting lost in what I do, and not talking about who I am. I have been a bit haunted by this over the past three days. It has caused me to really think about who I am as a person. I know what I do, because I do it every day, but what I do is not fully who I am, its just an outward reflection of who Philip Cunningham is. What I do is connected to these things, but somehow takes on its own identity, an identity that I have tried to promote for the past 25 years as a staff member with Youth With A Mission (YWAM) and Steps of Justice. When I write newsletters, I write to communicate to others what is happening in our lives. I also write to seek prayer and communicate the need for continued financial support, as that is how we raise funds. I rarely write about who we are, and so I find myself focussing more on what I do, and missing who I am. Many of you have been following me for years, and you see what I do, which matters greatly, but here is who I am, outside of all the work I do with refugees, the poor and the vulnerable. I love 80’s hair bands. I don’t buy the music anymore, but when Guns N Roses or AC/DC come on the radio, I turn it up to 11. I also like worship music, specifically old hymns done in new ways. I love laughter and laughing with friends. A good friend is someone who can laugh with you when you are at your worst, helping you focus on the joy of life. I cry easily when someone has a victory, or is unjustly treated. I like making coffee. I like the process, the art and the feeling of turning a brown bean into a tasty drink in my cup. I like exercise, and feeling like I am in control of my fitness. I love getting up early (not sure when this happened, but it wasn’t when I was a teenager). I am a fixer. I am a 2 on Enneagram (the helper). I love helping others and being with others when they are hurting. I am empathetic, and a man of faith. I have always had an extremely strong faith in Jesus, His provision, His word and his protection. I am old, 47 to be exact. I like being different, and not going with the flow. It’s not that I try to be this way, it’s just that trends seem to turn me off, and always have. I like a clean/orderly house. I am slightly OCD about this, sorry Amy and kids. I am anxious and slightly insecure (working on this or sure). I don’t want to forget who I am, because if I do, one day I will wake up not doing what I do, and not knowing who I am. I want to laugh more, rest more, live more, love more, care more and be less anxious. I want to live the way God made me, and in that, I do the things I do, but also rest in the person that I am. Last year I read “Kill The Spider” by Carlos Whittaker. I am realizing that the spider I need to kill is the finding my identity in what I do, and not in who I am. This spider is literally taking me down, as it is growing and growing, and I am having to do more and more to find satisfaction in who Phil Cunningham is, and this is not the fullness of life that God promised. Today is a new day, a day where I get back to who I am. I am not going to change what I do, because it comes out of who I am, but I am no longer going to find my identity in it. Over the past two days people I have known for almost twenty years, and people I have never met are donating to help the situation in Tijuana, Mexico. I am not taking sides, I am not saying that the Hondurans should have come, or shouldn’t have come, I am simple trying to respond, and inspire others to respond to a need. 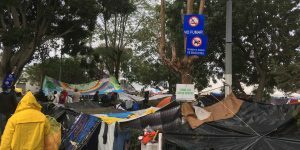 Yesterday I went to the largest migrant camp in the city, It looked similar to the situation that I saw in Haiti after the earthquake, and the Philippines after the typhoon. Tents everywhere, desperation, food lines, security and beautiful people, including the Mexican government helping where they can. The rains started yesterday too. I know it’s Mexico, but when the temperature drops to 60 degrees (10 for you Canadians and Europeans) and it is pouring rain, it’s cold, especially if you’re sleeping in a tent. In the camp, there are approx. 5200 men, women and children fighting this cold, wet weather. The ask from the workers and pastors in Mexico are for soap, tents, tarps and sleeping bags. Last night, Steps of Justice, the non profit I run purchased some of these items, along with warm socks for men, women and kids. We will also be purchasing colouring books, and tents. We are compelled to respond, to be the embodiment of Jesus, who made other peoples problems his own problems. We are honored to do it. 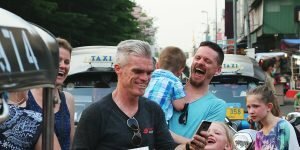 Thanks again for your inspiring response to this crisis, to those of you who are posting, praying, giving and sharing. The world is watching this going on, and I want my response to always be one of generosity and and love. You can give through Steps of Justice, and your gift will go towards this need. The Gospel Comes with a House Key. 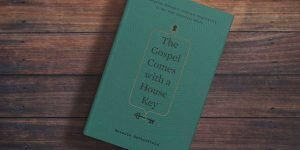 These past couple of weeks I have been reading The Gospel Comes with a House Key: Practicing Radically Ordinary Hospitality in Our Post-Christian World by Rosaria Butterfield. I am not pounding through this book, I am just taking my time and soaking it all in. Rosaria is writing about the way that I want to live, but have yet to get the courage up to dive all in. The book is inspiring, as is Rosaria’s story, courage and convictions. As a YWAM staff, I have been around good hospitality all over the world, but this book is different, it is talking about hospitality to my friends, my neighbors and the stranger. I have also learned a lot about hospitality from my Syrian friends over the past two years. I see the importance of hospitality, bringing people into your home and loving them as a brother or sister. One of the sections of the book that is sticking with me is where Rosaria talks about being a guest and a host. She talks about how we are never just guests, and we are never just hosts, we need to be both. When we go to a persons house for dinner, as a guest, and there is still work to be done to get the food ready, we become the host, jump in, and help cook. When we go to church, we sit and learn, as guests, and we give our tithes and help with childcare, as hosts. This is such an important life hack for sure. I recommend picking up this treasure, it will fill you with faith, hope, and love, in a time where our nation is full of doubt, fear and hate. The Gospel Comes With A House Key- Amazon.